When it comes to equipping learning spaces, one size definitely does not fit all. Social, technological and economic trends are reshaping how students learn. Advancements in tech and the emergence of digital learning has redefined the classroom, opening the walls (both figurative and at times literally), making high quality resources available to a global audience — including peer-to-peer feedback from fellow students who might sit at desks thousands of miles apart. This poses an intriguing challenge to architects and school design pros — how does one future-proof a classroom or education building? Spatial requirements are being redefined by new and varied learning methods. Students are spending less time chained to a desk in a single classroom, sitting in neat static rows listening to a teacher read passages as they flip pages in a textbook to follow along. There is a growing demand for collaborative and trans-disciplinary workspaces, maker stations, quiet spaces, labs and innovation hubs. Flexible learning spaces are in demand, allowing for breakout small groups or reconfiguration on the fly. One common element enhancing many of these spaces is projectors or displays and audio visual tech. The ability to change a projector’s location, either via mobile cart or adjustable mounting which can be shifted with ease, can be key to making the most of space. Displays that work both in unison for a large backdrop, with the ability to changed to a divided view to share individual work, offer another solution. 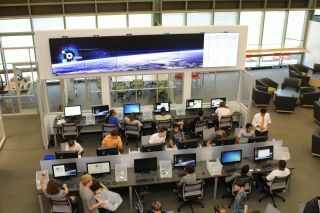 Charlottesville High School opted for this idea, installing two NEC Display video walls in their spacious Sigma Lab, which includes dramatic 20-foot tall ceilings. One video wall features a 2x2 array of 46-inch displays, while the other uses the same displays in a 2x6 horizontal configuration. The project resulted from a combination of curriculum needs, student desire and national needs specifically focused on advanced manufacturing. Hiperwall software allows teachers to share a single image across all the panels of a wall, but students can also share the screen from the computers at their workstations. Active and project-based learning has become the standard, which is great for students but can be challenging for educators with a never-ending array of presentations to prep. Convenience and attention to connectivity for both wired and wireless tech is key to a seamless day. Fortunately, new developments by tech companies are making strides in easing the growing pains. “We recognized that there was an opportunity to improve upon our technology in order to support educators and presenters on a deeper level,” said Joe Gillio, Senior Director Strategic Planning and Marketing of Casio’s Business Projector Division. The company’s newest line of projectors uses Casio Education Solutions, an included system with 2019 lamp free models. An Auto Input Search eliminates the need to set the input port — allowing educators to instantly plug the PC into the projector and start class. Transitioning from one class to the next is simplified using an Auto Projection Off feature, which puts the projector into stand-by mode. A Countdown Timer helps classroom management for group work and separate learning stations, while Mirror Mode reverses project images to show form and movement. BYOD schools enjoy Quick Projection wireless connections to share student presentations and a Moderator Function which lets teachers choose a presenter from the classroom and project their PC onto the screen with the tap of a button. IT managers can even pre-create an icon for students and teachers to add to their devices, to avoid re-installing each use.